Now that we've gone through the adoptions for 2012, let's take a look at who we currently have in our adoption stable. This list is always subject to change, not because we're adopting them out so fast, but because some cats have been on it so long we basically consider them residents (I'm looking at you, Marbles). Marbles: She's been with us for many years now, she's come close to being adopted a few times but still hasn't found that perfect fit yet. We love having her, she's a tough street mama who loves to hang out on the stoop in summer (and winter, for short periods). She carries her toys around and howls in the middle of the night, loves cardboard boxes and enjoys a good slap fight. She has this weird allergy which is probably the reason she hasn't found a home, she appears to be allergic to something in our house but we haven't figured it out yet. It may very be that she's allergic to other cats, if we could only find a kind person who only wanted one cat, she would probably get over it in no time. This is often the Catch-22 of fostering: we're giving her a place to stay, but it's this very place that is keeping her from finding a real home. Annie & Phinneas: siblings, or just friends? 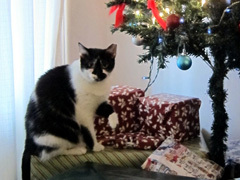 Annie & Phinneas: The queen and king of our backyard feral colony, these two have turned out to be quite tame. But I don't think they'd do well without one another inside. We brought Phinneas in once when he was sick, he was really freaked out until we brought Annie in to keep him company. Then they both were fine. 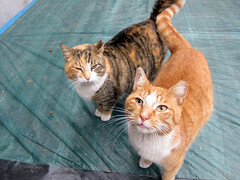 Until we find that person out there who's looking for two fat street cats, they will continue to live out back. It's not ideal but they stick close to home and have heated cat houses to ride out the winters. Bebo: Our only foster who doesn't live here. When we did a small TNR project in Sunset Park last year, we met this handsome fellow and got him fixed along with the ferals. He is a street cat but very sweet and gentle. He lives in the garage of some folks who live on the block, they take pretty good care of him although I sure wish he could live inside the house. They are in the process of moving so we're trying to find him a real home since they can't take him when they go. He's such a nice guy, seems like somebody out there would benefit from having him. Know anybody? Jake: A homeless woman found Jake, scrawny and dirty with a slash across his nose, in the small park across the street from us. We took him in and fattened him up. He is probably not even 2 years old and is unrelentingly energetic. His energy often gets him into trouble, whether knocking into things or getting grabby when human hands are near. But he swears he's working on it! I suspect any home Jake lives in never need worry about rats or mice, he is a born hunter! 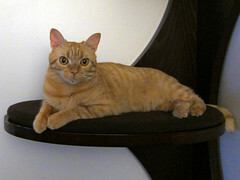 Effie: This tiny orange lady is one special cat. We think she might have a form of dwarfism as her legs are short and stubby and her head is a little oddly-shaped. She's also FIV+ but that doesn't stop her at all. She loves people and wants nothing more than to get out of our house and find her own place away from all these damn cats. She tolerates them for now, but I can tell she secretly hates them all! But she loves people, can't get enough of them people! Beau: This strapping lad has had a tough year. First his owner died, and then when the authorities came to his apartment, someone let him out on the fire escape and forgot about him. 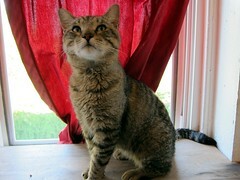 It was pure luck that some kind people came over the next day to collect the cats and found him stranded out there. Consequently, he's a little traumatized by it all, so he's very shy with new people. But once he settles, he is playful and affectionate. He will run around the room, bucking like a little bronco, and talking in his weirdly high-pitched voice. 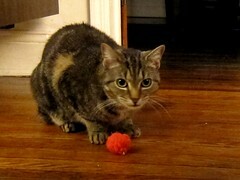 Minnie: Don't let her standard-tabby exterior fool you, Minnie is one of the greatest cats you will ever meet. She is instantly on friendly terms with all other cats, making her a great choice for people who already have a cat (or even a friendly dog). She is very loving, purring constantly, and even though she's 11, she plays like a kitten! She's not flashy, just a very solid cat who will no doubt exceed any cat enthusiast's needs. Dauphin: When we trapped this guy, he was vicious. He had a flea collar, so we knew he had been tame at some point in the past. But the collar appeared to have been put on when he was smaller; it was slowly strangling him as he grew. Still wild after getting fixed, we returned him to the street. Months later he showed up, plumper and much sweeter. He now waits for pets on the stoop, and is generally a fixture on the block. We hope to find him a real home someday. 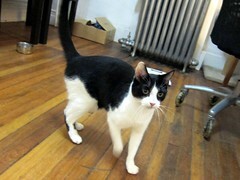 Creflo: This guy showed up recently, he has a lot of charisma so I think he will be an adoption candidate soon. I can tell he's not really feral but he's keeping his distance for now. I was hoping to win him over without trapping him, but we're ready to do it if need be. Expect more on him soon. Old Blue: The group we work with, Neighborhood Cats, get alerted whenever an eartipped cat gets brought to Animal Care & Control (eartipping is way to signal a feral cat has been fixed). If they can't find the caretaker they ask around to see if someone can assimilate the cat into their own colony. 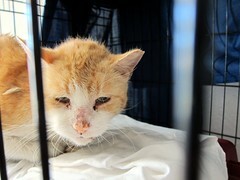 When we saw this old-timer (10 years old at least) and that he was from our area, we offered to take him in. It's probably not a stretch to say we were also motivated because he looks a bit like our favorite feral of all time, Mugsy. 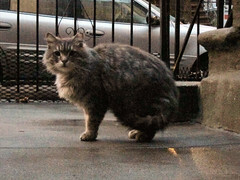 Mugsy was one of our first TNR cats, he tragically died in 2010. Even though this guy is very different, we wanted to give him a shot at a better life. So we're working to fatten and clean him up. He's already shown he's not actually feral, letting us pet him and purring up a storm. I'm not sure what we'll do with him, but he'll be safe either way. 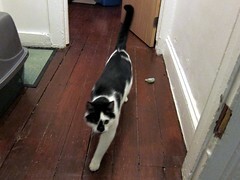 This entry was written by Jimmy Legs, posted on January 4, 2013 at 4:13 pm, filed under Adoption and tagged adoptable, bushwick street cats, cat, Feral, neighborhood cats, TNR. Bookmark the permalink. Follow any comments here with the RSS feed for this post. Both comments and trackbacks are currently closed. Hope your kitties are doing well outside. I just agonize when it is this cold.